Whether you already have a dog and you are considering a pet bird, or you already have a bird and are considering a pet dog, you are sure to have your work cut out for you regarding integrating them into the same household. While it can be a challenge to train dogs and birds to get along, it can be done as long as you are patient and always make provisions for the safety of each animal involved. To learn more about the proper way to introduce pet birds to pet dogs, check out the information below. Following the tips outlined here can help you make sure that the introduction process goes as smoothly as possible. Dogs, like cats, are predators in the wild, and most will naturally view a bird as prey who should be pursued and conquered. Even if your dog is timid with a less prominent prey drive than others, the instinct to hunt a bird will always certainly be there somewhere. 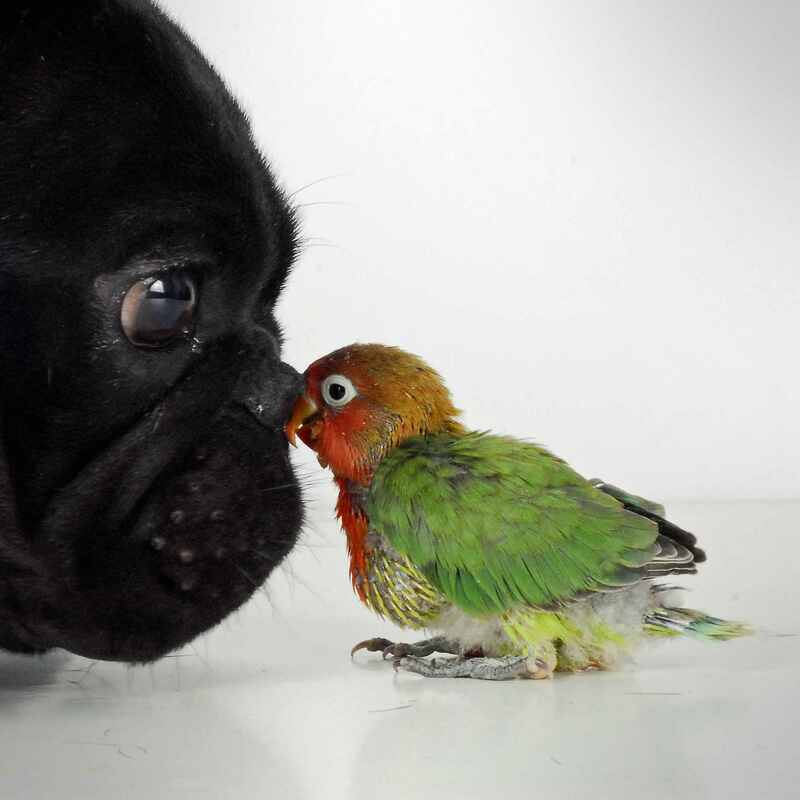 Start very slowly when introducing your dog to your bird to help them get used to each other. Bring them into contact with each other over the course of a couple of weeks so that they can become comfortable together -- don't try to rush it overnight. Rushing things could possibly lead to mistakes and accidents, which can be life-threatening for your pets in you aren't careful. When you first go to introduce your dog to your bird, choose a neutral area that neither animal will consider to be "their territory." For birds, this will be a room that their cage is not normally located in, and preferably that they spend little time in. Getting the animals out of familiar surroundings will help to reduce the potential for aggressive behavior and make them more agreeable in general, which can be helpful in these sorts of situations. Keep your dog leashed and your bird caged at first. One of the biggest mistakes that you could make when introducing a dog to a bird is to have either animal loose in the room that the introduction is taking place in. Make sure that your bird is placed securely inside of their cage at all times that the dog is present, and make sure that the dog is wearing a leash. Failure to restrain either animal can result in disaster if one decides to charge at the other, so until you have established that they are both comfortable, keep them confined. Reward the animals for good behavior. One thing that dogs and birds have in common is that they are both often pretty easy to distract and bribe with food. Offering them plenty of tasty treats can be a great way to reward each of them for good behavior during the introductory phase of their relationship. Be sure to have plenty of treats for each animal on hand before beginning your sessions with them. Never leave them together unsupervised. After several sessions of bringing the bird and dog into the same room together and helping them get accustomed to one another, you can begin to allow your dog to be off-leash in the area as long as he or she continues to behave and not harass the bird. However, for your bird's protection, never allow him or her out of the cage while the dog is present, and never leave the animals in the same room together unsupervised. Accidents can always happen, even with the most well-trained and trustworthy canines. The best way to reduce the risk for your pets is to simply keep your bird inside of the cage while the dog is around.